Repeal Day, which celebrates the end of Prohibition, isn't just about drinking copious amounts of booze. It's about celebrating the government's admission that its attempt to control the country's morality failed miserably. And what better place to champion the victory of alcohol than the home of some of the finest wines in the world? Sidecar Cointreau, brandy, lemon juice shaken with ice, strained into a sugar-rimmed cocktail glass. Aaah. Sazerac Peychaud's bitters and one sugar cube muddled in a glass, then mixed with rye whiskey before being served in a glass lined with absinthe. Aaaah. Champagne Cocktail Shake three dashes of bitters onto a sugar cube in a Champagne flute before filling with Champagne. Aaaaah. Negroni Gin, dry vermouth and Campari, in equal parts, shaken with ice and served in a rocks glass (pictured). Aaaaaah. 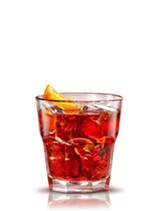 Old Pal Substitute gin for rye and dry for sweet vermouth in a Negroni (aaaaaah, my personal favorite). Celebrate government's admission of failure with a drink or three on Friday, Dec. 6, at the Napa Valley Museum. 55 Presidents Circle, Yountville. 7pm. $45. 707.944.0500.